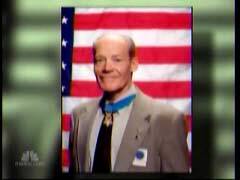 On Wednesday’s NBC Nightly News, anchor Brian Williams took a moment to remember Vietnam War veteran, retired Colonel Robert Howard, who was awarded many honors for his heroic service, including the Medal of Honor, eight Purple Hearts, four Bronze Stars, and two Dinstinguished Service Crosses. Williams began his tribute: "We have a brief special word tonight about a very special man whose story you should know about, in part because his story will be told for generations to come. Robert Howard might have been the toughest American alive while he was among us. Bob was the only man ever to be nominated for the Medal of Honor three times for three separate acts of staggering heroism in combat." 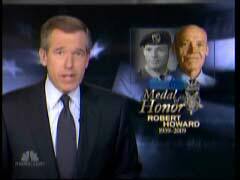 After recounting some of the honors bestowed upon Colonel Howard, Williams related: "It's believed Bob Howard was the most heavily-decorated American veteran of the modern era, period." The NBC anchor further recounted: "In one 54-month period he was wounded 14 times. He served five tours of duty in Vietnam. And in recent years, he loved his trips to Iraq and Afghanistan to visit the men and women in uniform and in the fight there." Williams concluded: "That old expression, ‘They don't make them like him anymore,’ well, they don't. Bob Howard died today. He was 70 years old. Cancer did what the enemy never could do. It got him and brought him down. He leaves behind three children, several grandchildren, a lot of us who were proud to be his friend. In addition, Bob Howard leaves behind a grateful nation." BRIAN WILLIAMS: We have a brief special word tonight about a very special man whose story you should know about, in part because his story will be told for generations to come. Robert Howard might have been the toughest American alive while he was among us. Bob was the only man ever to be nominated for the Medal of Honor three times for three separate acts of staggering heroism in combat. But you can only receive one Medal of Honor per lifetime, and so that's what he got in 1971 from President Nixon. That's not all he got, though. He received eight Purple Hearts, eight of them. There were Silver Stars, four Bronze Stars, two Distinguished Service Crosses. It's believed Bob Howard was the most heavily-decorated American veteran of the modern era, period. He was a proud product of Alabama, and he let you know it. He was a Green Beret, Special Forces. While technically he fought in the Vietnam War, he fought in Laos and Cambodia and all kinds of other places where we were once told U.S. forces weren't fighting at the time. In one 54-month period he was wounded 14 times. He served five tours of duty in Vietnam. And in recent years, he loved his trips to Iraq and Afghanistan to visit the men and women in uniform and in the fight there. Bob had two master's degrees, but for the most part he was a soldier with only one employer. When he retired from service back in 2006, as a full colonel, he'd been an employee of the US government in all for 50 years. That old expression, "They don't make them like him anymore," well, they don't. Bob Howard died today. He was 70 years old. Cancer did what the enemy never could do. It got him and brought him down. He leaves behind three children, several grandchildren, a lot of us who were proud to be his friend. In addition, Bob Howard leaves behind a grateful nation.